In spring the eye-catching flowers of our native iris greet us. Native irises are found in all 48 continental states and Alaska and produce numerous, large and colorful flowers to attract pollinators. These elegant flowers are named for Iris, the Greek goddess of the rainbow. Whenever a rainbow appeared, the ancients assumed that the goddess Iris was delivering a message to them from the gods. Iris was also thought to lead the souls of women to the realm of honored dead in Greek mythology. Some cultures still plant iris on graves of honored women. Abundant here in north Georgia, Iris verna, the dwarf iris, grows to about six inches with fragrant flowers. They are usually found in small, dense patches. The bloom consists of three downward hanging septals (called falls) and three upright petals (called flags). Native to shady pine forests, dwarf iris prefer rich, acidic, moist to dry well-drained soil in full to part-shade. They slowly form colonies by means of rhizomes. 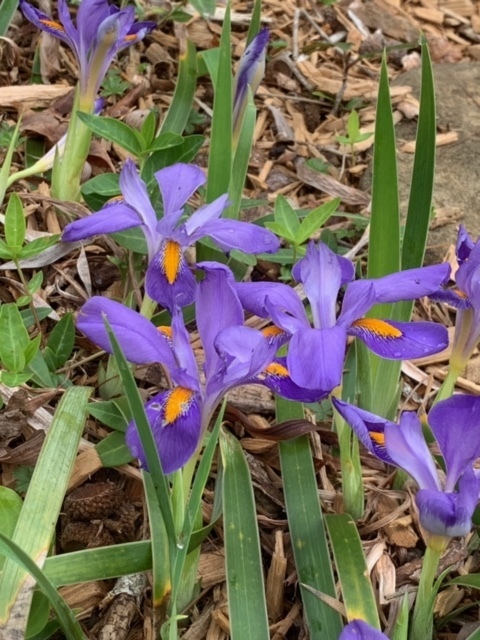 An exceptional choice for a woodland or shaded rock garden, dwarf iris bloom in April and May. In addition to their elegant shapes and exuberant colors, dwarf iris bring one more exceptional quality to the garden: they are not only deer-resistant, but deer-proof as well! Native irises are difficult to transplant and are better propagated by seed. (Always ask permission before collecting seeds.) Native irises are also available from nursery sources. Wherever you find them, wherever you plant them, these handsome and hardy little flowers are true gems. They are an extraordinary bearer of nature’s bounty.